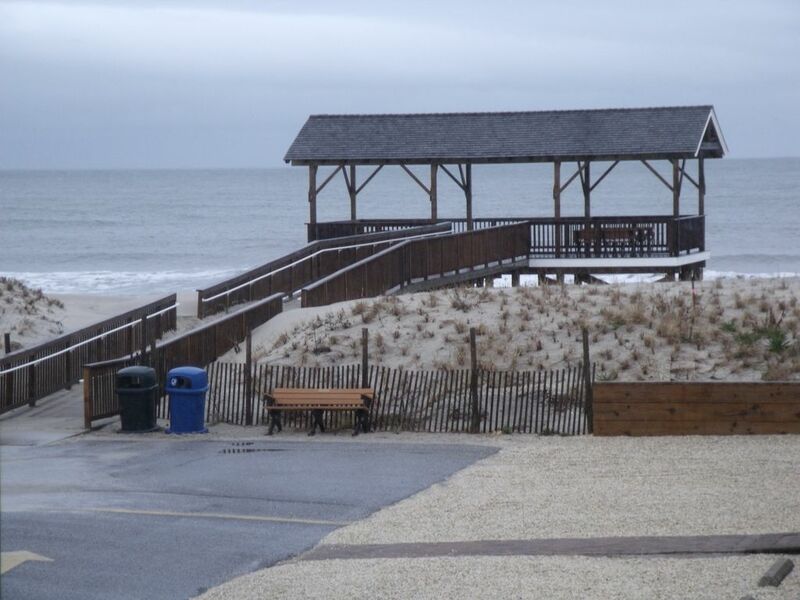 Our beautiful totally renovated condo is located on the beach in the heart of Beach Haven. The condo development is located at 20 Pearl Street and consists of 17 units. Each unit is located side by side surrounding our heated pool. The common pool deck and patios are equipped with pool/patio chairs ,tables and umbrellas. The development is completely fenced in and we have our own private entrance to the beach with an outside shower to rinse off when you leave the beach. Our beach has a lifeguard station and a new Gazebo. Each unit has its own private parking space. Our condo is within walking distance to several restaurants and attractions including but not limited to Engleside, Sea Shell ,Marlin ,Buckalaws , The Chicken and The Egg,Uncle Willies,Ice Cream parlors ,Murphy's Super Market, Fantasy Island, Bay fishing and more. Our condo is unit #1 and has 2 levels. The 1st level has a nice entrance way ,Master Bedroom with a queen bed that is equipped with a 16" pillow top mattress , flat screen tv , sitting area for putting on make up or reading ,a closet and a separate entrance to the bathroom. Also on the first floor is a great Bunk Room area with twin bunk beds with drawers and a flat screen tv on the wall. The beautifully renovated bathroom is also located on the 1st floor which is accessible from the hall or master bedroom. The hall closet has a full size stackable washer /dryer . The second floor has a living room area with amazing beach views and a large flat screen tv on the wall , a dining area and a brand new Kitchen area with Granite tops and Stainless appliances. The second floor also has a 6 ft sliding door with a great deck that has a ocean view. Everything in our unit is Brand new and it has Wifi and a Smart tv. ! We will supply 4 beach chairs, 4 large beach towels, large cooler,1 beach umbrella,4 beach badges and 4 pool passes for you outside beach/pool day needs. Our unit will also be equipped with all linens ,sheets, towels ect. for your sleeping and bathing needs. We are owner operated so we will do all the cleaning and setting up so there will be NO problems with cleanliness when you arrive. We have been coming to the Pearl St Beach for years and when the opportunity to purchase a condo in The Sans of beach Haven arrived , we couldn't have been happier. We feel this is the BEST location in Beach Haven. We totally renovated our condo and it was completed in April,2015. Everything is new and we plan on making our guests come back each year and feel they will be nothing but totally satisfied with their stay! Everything was perfect! Great place, great host, exactly as described. Would absolutely stay here again. The condo was a perfect fit for me and two elementary-age kids to get a quick, change-of-scenery, spring break weekend. The weather was a bit chilly, but since the beach was right in front of us, we took some good walks along the ocean. We appreciated the comfortable beds, spacious living area, and well-equipped kitchen. Having towels, linens, and other basics provided made this an easy trip to plan and execute. Hope to be back! Best condo on the island! If you are on the fence about renting this property, jump the fence! Ron’s place is amazing! The decor and layout are perfect for a couple or family of four. Shortest walk to the beach and plenty of space to relax when you get back! The pool will be perfect after a hot day in the sand. Don’t miss a chance to stay here.... believe me! We walked everywhere - Tucker’s, Buckalew’s, Ship Bottom Brewery, and more. Thanks to Ron and his family for an awesome St. Paddy’s Day weekend getaway! This is a lovely condo to rent. You can literally walk to all the places you love to enjoy in Beach Haven. The description of the place is right on...amazing view of the ocean, easy access to the beach, very comfortable and you'll even find the neighbors in the condo complex are extremely friendly. This is perfect condo for a couple or a small family. We would recommend it and definitely plan on going back again! This condo couldn't be more convenient, with just a stone's throw away from a lovely beach and a short walk or bike ride to market, shopping and restaurants. The condo is beautifully appointed as shown in the photos. It is quiet and well maintained. Not having to cart chairs, cooler and beach towels were a welcome bonus. We will be back for sure.